So, I want to make monster manuals, but here’s the thing: I want to make them piece-by-piece, one or two monsters at a time, using Patreon. I’ve teamed up with my friend Nathan Jones, who did the Metamorphica cover. He’s drawing the monsters, I’m writing them up for role-playing games (Dungeon World and Labyrinth Lord specifically). It’s still a bit of a work-in-progress, and I’ll be updating it as we make final decisions on the details. Here’s the first monster, free for everyone: the Satyrical Dramatists! Download the Satyrical Dramatists for Dungeon World. Download the Satyrical Dramatists for Labyrinth Lord. These are pdf documents, 5.5″x8.5″ format, with a B&W illustration of the monster and several pages of text, including a description, stat blocks, and some rules for using them as player characters instead of just NPC monsters. Future monsters will have different details, including possibly maps of their lairs, random tables (for treasure and other things), and maybe even short scenarios. I’ll upload a second preview before we start this thing in earnest. It’ll be full colour, too! Why these two rules systems? 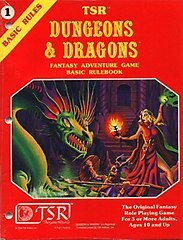 The games I play the most right now are various versions of old-school D&D and various Apocalypse World games. When I run a fantasy game, it’s either Dungeon World or Labyrinth Lord. These are the games I like playing, running, and writing monsters for. If you only like one of these games, that’s cool, you can just ignore the other version because we’re not putting the two together in the same document. If you don’t like either of these games, sorry, but this is how it is. Dungeon World and Labyrinth Lord. Patreon is a pledge-based crowdfunding website. Unlike Kickstarter, you sign up to pay money each time a creator makes a thing, so maybe you’re paying a musician one dollar for each new song they release. Creators only get your money after they release content, not before. It’s not a pre-order facsimile. Like Kickstarter, there can be pledge levels where you can get more stuff, and stretch goals based on total monthly funding levels. If a creator takes a month off and doesn’t release anything, you don’t pay them anything. If they release a bunch of things in one month, you can pay them once for each, or you can limit your total pledges each month to a specific amount. You can pledge as little as one dollar, or as much as you like, and you can change or cancel your pledges at any time. Check out their website for more details. How will this Monthly Monsters thing work? Okay, so the basic gist of it is this: we are going to release a monster a month, unsurprisingly called the Monthly Monster. If you pledge $2 each month, you get the Monthly Monster emailed to you each month. When we have enough monsters to make a book, we’ll make a book and you’ll get a pdf of it sent to you for free, as long as you’re still subscribed to pledge. That sounds like it would take a long time, though, right? So there’s bonus monsters every month. If you pledge $2 a month, you just get the one Monthly Monster. But if you pledge $4 every month, you get both the Monthly Monster and all the Bonus Monsters! How many Bonus Monsters are there? That depends on the total funding level, but there’s always at least one. These will all be included in a single package, too, so they won’t count as multiple releases. There won’t be multiple releases each month, either. One pledge amount and one release, no more than once a month. We, Nathan and Johnstone, need this to be a financially viable project for us to undertake. Neither of us can afford to spend months at a time making monsters, hoping a book will sell once it’s finished. How many monsters we can create each month depends on how much money we’re making from them. More money, more monsters! It also affects how much time we can spend on these monsters, and whether or not we can do them in full colour (which takes longer). At $200: The Monthly Monster will be full colour, not B&W. At $300: There will be 2 Bonus Monsters (for a total of 3 monsters each month). At $500: At least some, and maybe all, of the Bonus Monsters will be full colour. At $750: There will be 3 Bonus Monsters (for a total of 4 monsters each month). At $1000: Every monster will be full colour after we hit this level of total pledges. At $1500: There will be 4 Bonus Monsters (for a total of 5 monsters each month). These figures are independent of your individual pledge amount, of course. At the $4 level, you get all the bonus monsters, no matter how many there are. The more people that pledge, the more monsters each person gets for their pledge, and the faster the book gets done. And when the book is done, all pledgers get it for free (everybody else will have to buy it normally), and then we can start making a second one. So, why should you even pledge for this project in the first place? Why not just wait for the book to come out at the end? Good question. It’s probably cheaper if you do that, but this isn’t about getting the best deal on a book. If you just wait, it might never even happen, and you won’t be able to get it for any price. This Patreon project is about making sure it does happens, and helping us build something a piece at a time. Without your support now, I can’t guarantee we’ll keep this project going in the future. A pledge level where you get to request a monster from us, once per season. A pledge level where I also mail you a physical copy of the book when it’s done, no extra cost to you. Random draws for original artwork. The higher your pledge level, the greater your chance of winning. Let me stress that again: I would really, really like to hear your feedback and ideas about this project if it is something that interests you. Not just pledge reward ideas, but your thoughts on stretch goals, using Patreon, monsters, and other aspects. This is really new thing, not just for us, but in general. There’s a few people using Patreon to make role-playing game materials already, and they’re all pretty different. We want this project to be successful, for us, for you, and for other people who want to use this model in the future. Hey, thanks for taking the time to read this! I hope you’re interested.